This is how my spa looks every morning before the pool pump starts up. 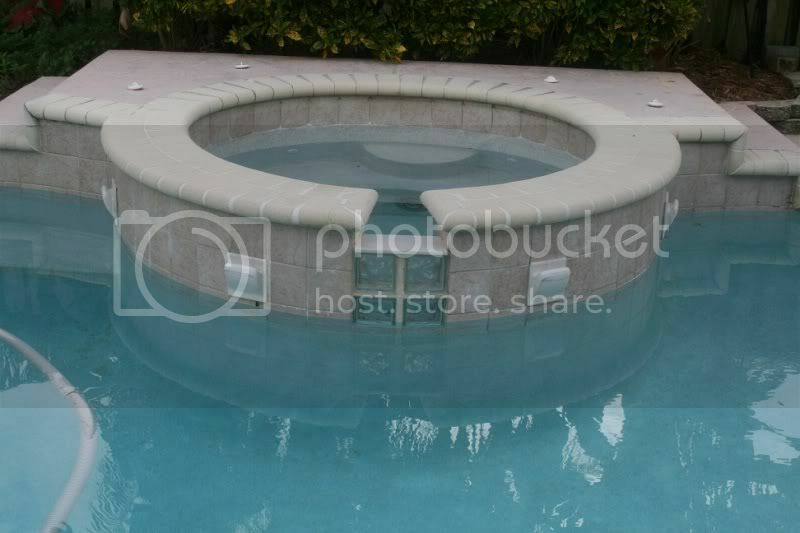 (The water in the spa is about 8" low and the pool water is about 1" high). Then once the pump starts up, it gradually fills back up and everything seems to be functioning normal including the waterfall. So my first question would be: Is my problem most likely the check valve on my spa return? Secondly, I'm a little nervous about doing this on my own. On one hand, it seems that this thing would 'unscrew' off, but on the other hand, there doesn't seem to be any 'wiggle' room around this thing and it also seems that there's already been some 'patchwork' done on this section of pipe. Should I anticipate any problems with the removal/replacement of this check valve? What exactly do I need other than a large set of pliers to crank the fasteners off? Should I use any kind of teflon tape (or other material) when putting on the new one? Like I said, I'm a little nervous about doing this so any words of wisdom or encouragement would be appreciated. Do nothing and live with spa level drop. Empty the spa to the pool level, shut the water to the spa, and if those are union ends that unthread and have o-rings and you can get the same check valve, swap it. No Teflon needed. Might take 15 minutes to do. I prefer the second option. Can you tell by looking at the picture if "those are union ends that unthread and have o-rings"? They SEEM to be the kind that are threaded by the grippy rings around them, but I cant say for sure. If they are threaded, they should only be hand tight. If you see glue, then the elbow to the ball valve are history. I can't see past the ball valve. If this is the case, replace the ball valve (cheap valve that will wear out anyway) with a diverter valve such as a Jandy Never-Lube when doing the repair. It's not hard to glue PVC. Use pressure rated pipe and schedule 40 fittings. Use primer and glue. Measure twice, cut once. Yup, bad check valve. Honest answer, the one they put in is a crappy one anyway. Get a Jandy swing check valve and put it in (I take the springs out also; it will swing back with the water pressure just fine and you don't need as much water to push it open). You will be much happier, and it is serviceable from the top, which the cheapy like the builder installed initially is not. I agree with PP's - change out the check valve to a swing type and also the ball valve to a never lube. Then you will not have to glue pvc again to repair as both are servicable from the top. 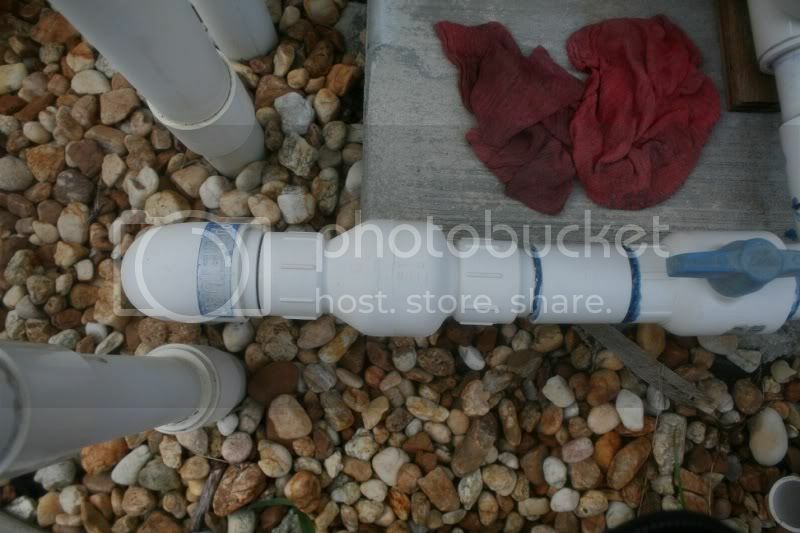 If you remove the rock and dig out all around the pipe going into the ground, it should give you enough wiggle room to do the installation. One note... my spa leaked too and I automatically figured it was the check valve or jandy valve, but it turned out to be a leak in the spa. So shut off the return and drain to the spa and leave overnight to check. With as much as it is draining down, I doubt you have a leak, but it only makes sense to rule that out first. Here is something worth a try. It worked for me in a similar situation. Use a toilet plunger on the spa return to try dislodge whatever is stuck in the check valve. You may have to hit is a few time. If it works, your in luck. If not, nothing much lost and you'll have to replace the check valve. Use a toilet plunger on the spa return to try dislodge whatever is stuck in the check valve.